(THE TEMPLE INSTITUTE)—Following last week's verdict in the case of Temple Mount activist Yehuda Glick vs the Jerusalem police, in which Judge Malka Aviv ruled that the police are "to ensure that Jews are able to pray on the Temple Mount, and not to act sweepingly to prevent Jews from praying on the Temple Mount," and that current police practices to the contrary are illegal, many Temple Mount ascenders anticipated the immediate dawn of a new era of religious freedom upon the Temple Mount. These hopes were quickly dashed the following day, when Jewish worshipers on the Temple Mount were subjected to the very same discriminatory restrictions that Judge Aviv had determined to be illegal. Two days after the verdict a Jew waiting to ascend the Mount, and still hopeful of a change in police policy in conformance with the ruling, asked the head of police security at the entrance to the Mount if, in light of the court verdict, restrictions on Jewish prayer would be lifted. The officer replied, "the verdict does not exist," as related by the Temple Institute's Rabbi Chaim Richman in an Israel National News interview later that day. Not satisfied with the remarks of a low ranking police officer, journalist Arnon Segal drafted a letter to the Jerusalem police, requesting an official response to "the question as to whether, in light of the ruling of the magistrate court acknowledging the right of Jews to pray on the Temple Mount, would the Jerusalem police be adapting their policy to accommodate Jewish prayer? 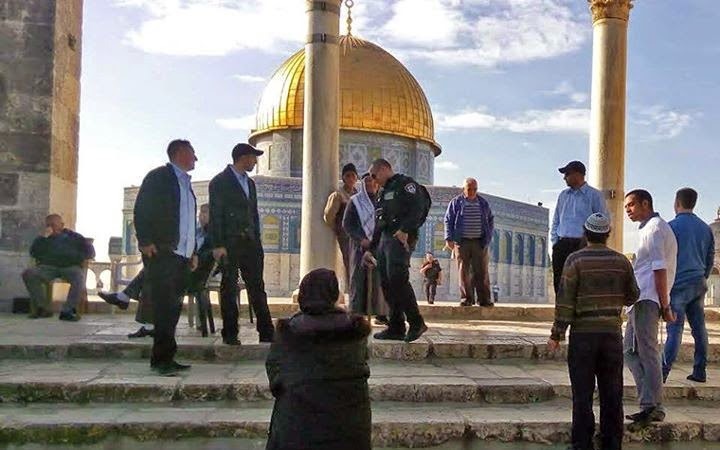 Do the police now recognize the legality of Jewish prayer on the Temple Mount?" "The Jerusalem police have determined that the court ruling in question dealt with the issue of monetary damages [by the police to be paid to an individual], and is currently pending, and that the verdict of the magistrate court is not binding on the state of Israel. The verdict will be appealed [by the police] in the near future. The Office of the Spokesman of the Jerusalem Police"
As ludicrous as the police response is, it is not unexpected. For many years Jewish rights on the Temple Mount have been the victim of government policy which refuses to fully integrate the Temple Mount into sovereign Israel (government declarations notwithstanding), and refuses to fully enact Israeli law on the Temple Mount. This predicament can today be fully related to Israel's relationship with Jordan, whose King Abdullah has been granted by Israel's Prime Minister the right to veto any expression of Jewish worship or sovereignty on the Temple Mount. Nevertheless, last week's magistrate court's ruling is another crack in the judicial establishment's tolerance of the untenable reality in which Jewish citizens in the Jewish and democratic state of Israel are denied their most basic of rights in the heart of Israel's capital, Jerusalem. The groundswell in the number of Jews who daily ascend the Temple Mount is forcing the judicial and political establishment of Israel to deal with a matter they have, for years, successfully swept under the carpet. We encourage Jews to continue to ascend the Temple Mount and to continue to insist on their right to pray on the Mount. Last week's court ruling was just one more sign that change is on the way.